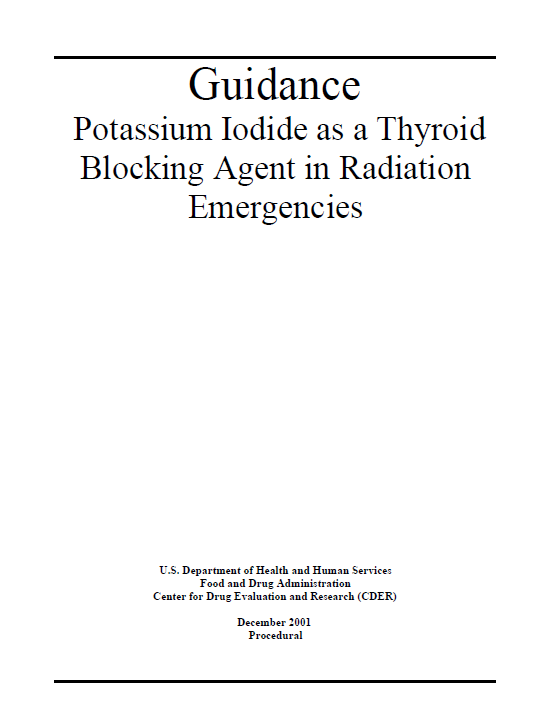 The objective of this document is to provide guidance to other Federal agencies, including the Environmental Protection Agency (EPA) and the Nuclear Regulatory Commission (NRC), and to state and local governments regarding the safe and effective use of potassium iodide (KI) as an adjunct to other public health protective measures in the event that radioactive iodine is released into the environment. The adoption and implementation of these recommendations are at the discretion of the state and local governments responsible for developing regional emergency response plans related to radiation emergencies. These recommendations were prepared by the Potassium Iodide Working Group, comprising scientists from the FDA’s Center for Drug Evaluation and Research (CDER) and Center for Devices and Radiological Health (CDRH) in collaboration with experts in the field from the National Institutes of Health (NIH). Although they differ in two respects (as discussed in Section IV.B), these revised recommendations are in general accordance with those of the World Health Organization (WHO), as expressed in its Guidelines for Iodine Prophylaxis Following Nuclear Accidents: Update 1999 (WHO 1999). The effectiveness of KI as a specific blocker of thyroid radioiodine uptake is well established (Il’in LA, et al., 1972) as are the doses necessary for blocking uptake. As such, it is reasonable to conclude that KI will likewise be effective in reducing the risk of thyroid cancer in individuals or populations at risk for inhalation or ingestion of radioiodines. Thyroidal side effects of stable iodine include iodine-induced thyrotoxicosis, which is more common in older people and in iodine deficient areas but usually requires repeated doses of stable iodine. In addition, iodide goiter and hypothyroidism are potential side effects more common in iodine sufficient areas, but they require chronic high doses of stable iodine (Rubery 1990). In light of the preceding, individuals with multinodular goiter, Graves’ disease, and autoimmune thyroiditis should be treated with caution, especially if dosing extends beyond a few days. The vast majority of such individuals will be adults.